Check out the Nissan IDx concept car. Is this the S16? Many of the group of co-creators who were involved with IDx NISMO are people who grew up playing racing simulation games that feature cars of the past and from all corners of the globe. They had a natural desire to realize that virtual driving experience in a real car of their own. Not limited to being inspired just by racing cars, IDx NISMO was born from a refined combination of the freedom to borrow liberally from memorable vehicles of yesteryear and the present, in addition to whatever was felt exudes “cool." 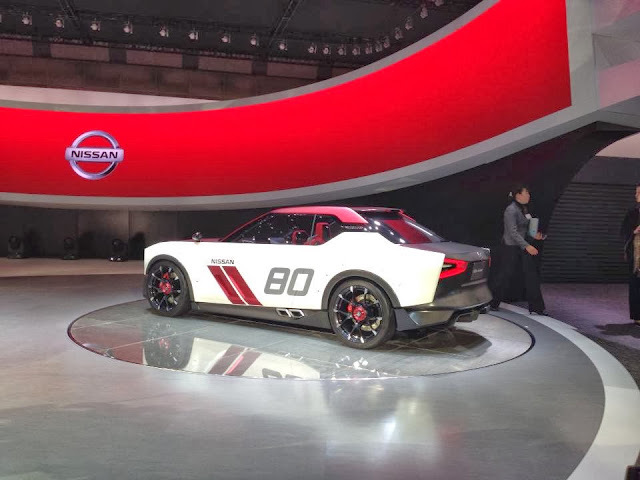 The IDx NISMO's co-creation dialogue took the distilled heritage of Nissan's basic box-shaped racing vehicles of the past and married it with various intriguing new details. This resulted in a car that appears to be timeless and moored in a place all its own. Though IDx NISMO shares the overall length and height of its Freeflow cousin, the 1.8 meter width of the car is testament to its low, wide stance that emphasizes its sporty proportions. One of the hallmarks of box-type racecars is speediness conveyed by a reverse-slanted nose. On IDx NISMO, this frontal design element is embellished by an aura of seriousness communicated by the use of carbon panels. Side mufflers provide a pleasing exhaust note. The car also has contemporary touches such as front/rear and right/left aerodynamic spoilers and lightweight 225/40 19-inch tires. To meet the high expectations for a powertrain equal to the task of propelling such a formidable car, one proposal from Nissan's engineers is the combination of a high-performance, eco-friendly 1.6L direct-injection turbocharged engine together with a sporty CVT with 6-speed manual shift mode and synchronized rev control. The result is no less than an appealing mix of racing heritage with the finest of modern know-how. Scanning the interior reveals racing-inspired crimson alcantra seat covers that entice the eyes, complemented by Spartan-looking meters and gauges that animate the race-car ambience. The lustrous metal surfaces contrast nicely with the bright red suede trim that is augmented by blue stitching. This machine's soul-stirring design echoes the racing car imagery of the past united with the buzz digital natives get from the virtual world they know well. That this car could result from co-creation dialogue alone exemplifies Nissan's fresh approach to contemplating car design, and even kindles a fire in the hearts of people fond of the good old days of high-performance cars.